Honestly, if you are going to master something, you might as well master the bow and arrow. Worked for Robin Hood! Bowmaster for the iPhone and iPod Touch has players battle compete with A.I. archers with names like Wilbur the Novice and Albert the Accurate in a shooting range. Using a bow and arrow, the goal is to shoot wooden cutouts of animals that range from moose to foxes. The animals move along a wooden track (some animals, however, stay stationary). Later in the game, the wind is even a factor! Your score varies depending on where you hit the animals. But does this game hit its target or does it miss its market? 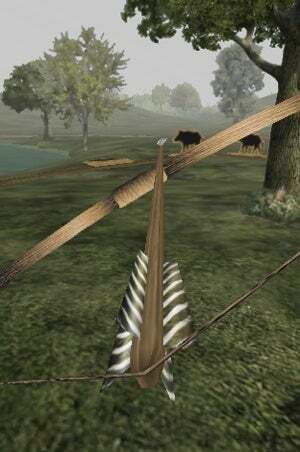 One Bow, Many Arrows: The gameplay mechanic is quite simple. Using one finger, you steady the bow. The other figure is used to draw back the arrow. By tilting the iPhone/iPod Touch, you can look right or left, up or down. Straightforward and wonderfully fun. And while there isn't much more to it than that, I really got into the gameplay. Each level is somewhat repetitive as the animals spawn from the same places; however, that enabled me to focus on getting better at the core gameplay without added frustration. And when you shoot an arrow, it switches to a Robin Hood: Prince of Thieves style "arrow cam", which is a neat touch. Lush Shooting Ranges: Green hills. Fog. The perfect spot to hunt wooden animals. While the players are locked into their shooting position, it is possible to shoot the arrows a good distance. This gives the game a more expansive feel and makes the environments feel bigger. The fog and the green hills not only set the mood, but cleverly mask game boundaries. Very subtle, and it works well at creating the illusion of an expansive shooting range. A Better Position: The difficulty curve between the first A.I. archer and the second one is steep — for me, I found it to be the steepest jump! That wasn't problematic. What totally bugged me was that my competition always seemed to be positioned at a better angle to snipe wooden animals. I kinda wished we were shooting from the same spot as that would be fair. But life's not fair. And sometimes, neither is Bowmaster. Bowmaster is a solid title. It's on the short side, but not necessarily in a bad way. Hopefully the developer will flesh out the game with future updates to give the title the longer play life it deserves. Bowmaster was developed by Chromegekko for the iPhone and iPod Touch on May 17. Retails for $.99 USD. A code to redeem the game was given to us by the publisher for reviewing purposes. Mastered my bow, successfully challenged all foes.